Getting ready for my baby’s upcoming birthday, I wanted to plan a wholesome event that the kids would remember. So I turned to my friend friend Alice Nielsen of Styled-It. She’s truly one of the most creative women I know. 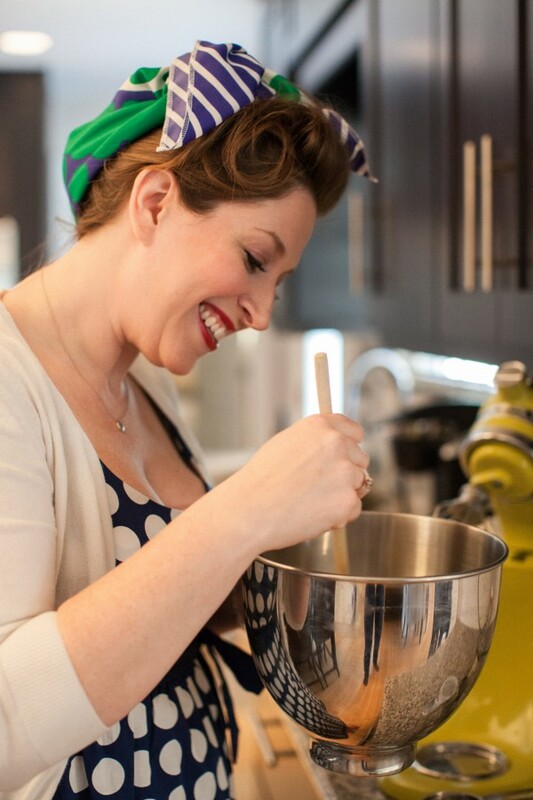 After several years in the event-planning business, she decided to teach people how to host their own parties and provides the most uberly creative workshops and tutorials to design your own memorable, hand-crafted events. 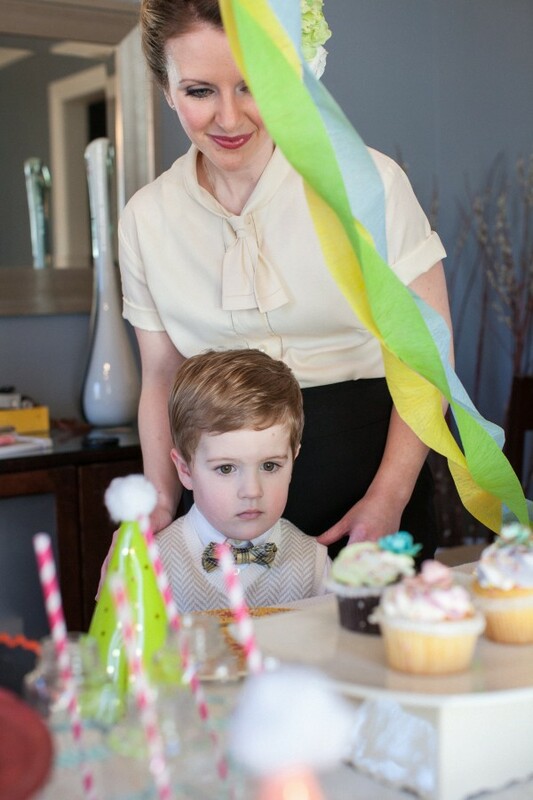 Alice dreamed up a vintage 1940s birthday party to bring in some kid-friendly, whimsical charm. 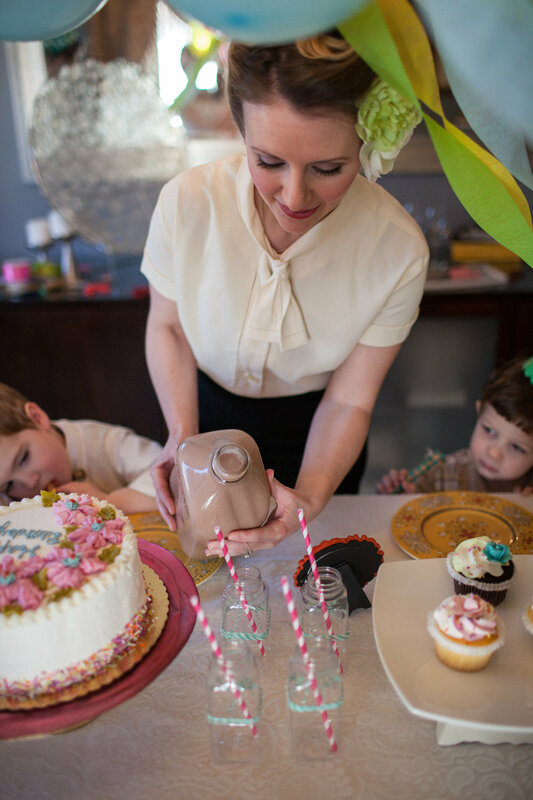 Read on for her tips on throwing a vintage birthday party of your own. 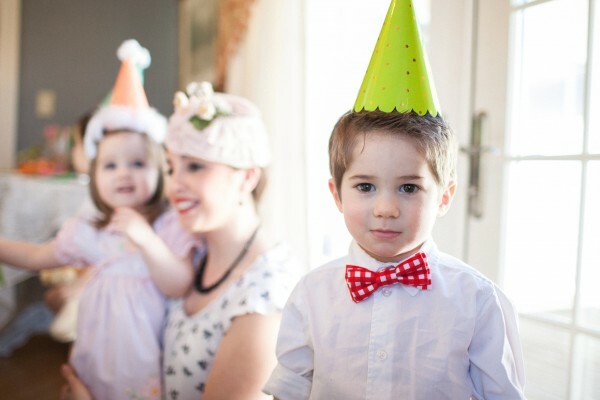 The birthday parties of this era gone by were magical! 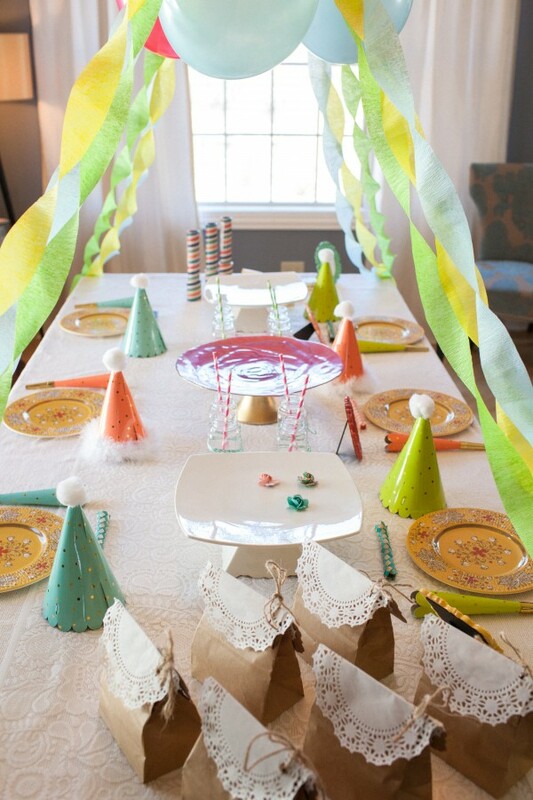 Today, the simplicity of decorating with twirled crepe paper streamers, balloons, paper hats, and party horns pristinely placed on the dining room table is a lost art. 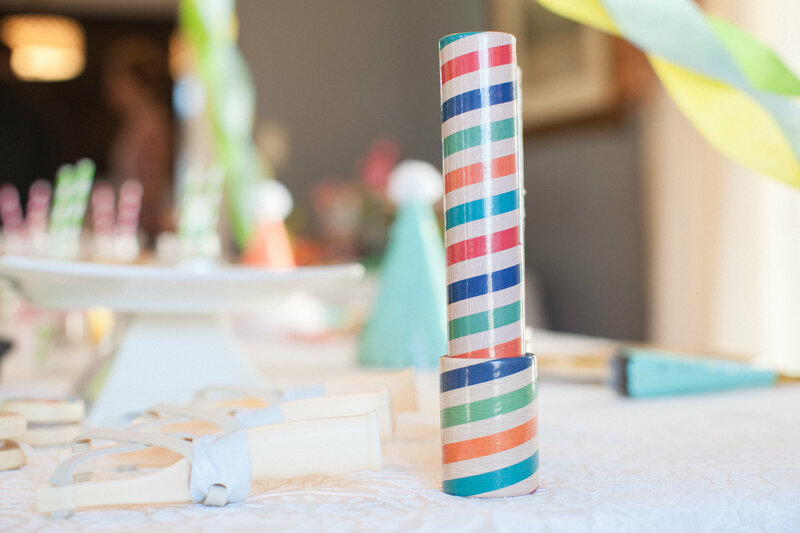 This was a time when a child’s guest list wasn’t narrowed to a specific gender or limited to a particular group of kids; instead, the party guests were your siblings, your extended family, and all the kids in the neighborhood. 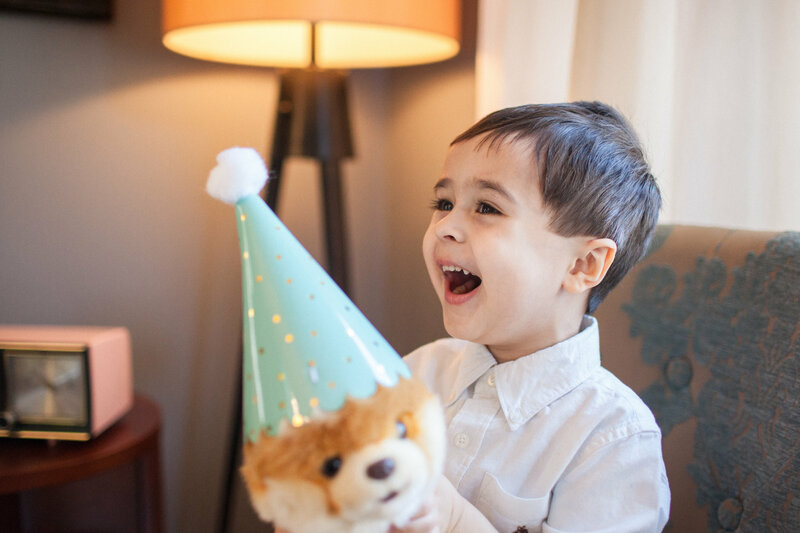 Having designed numerous kids’ parties over the years, I wanted to do something different, a party that would be simple and charming, yet affordable. I tried to think of a time or place when life was a little less complicated and expectations were within reach. 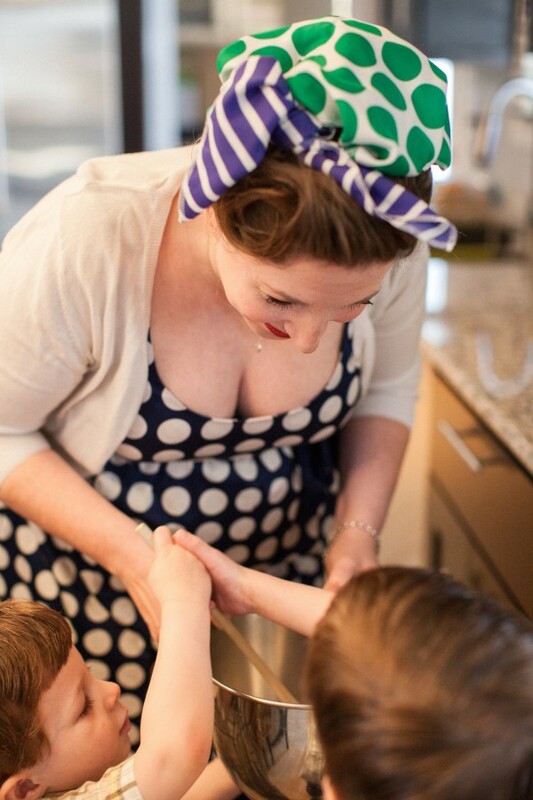 With that inspiration this nostalgically curated workshop was created to bring a vintage 1940s child’s birthday party to life! 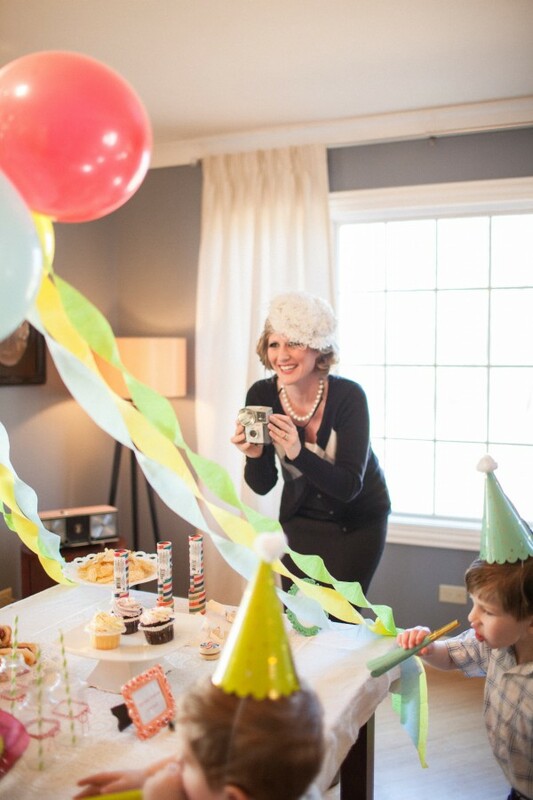 Our party décor included crepe paper streamers and multicolored balloons simply hung from a chandelier. 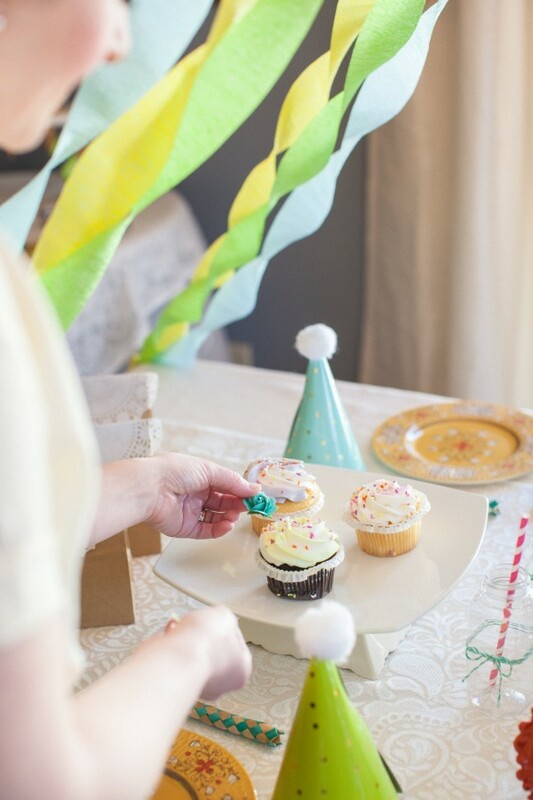 The party table was set with antique looking plates and embellished paper party hats and horns at each place setting. 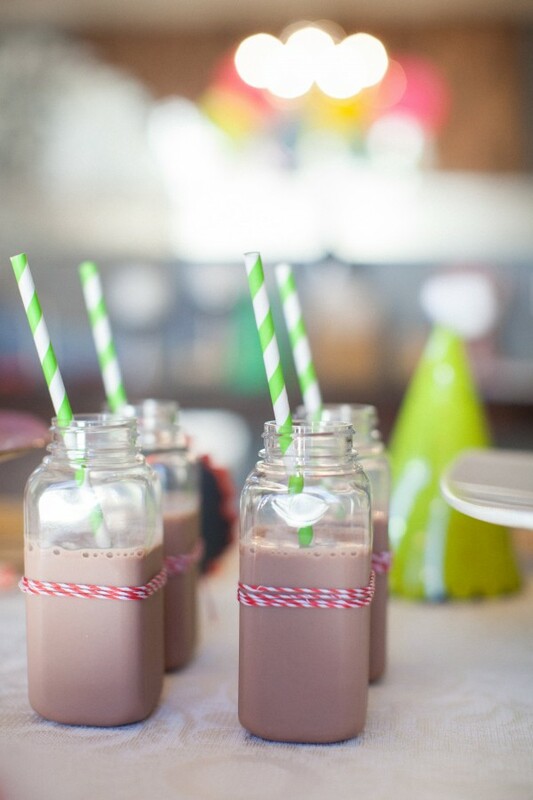 Chocolate milk was served in small milk bottles delicately tied with colorful twine. 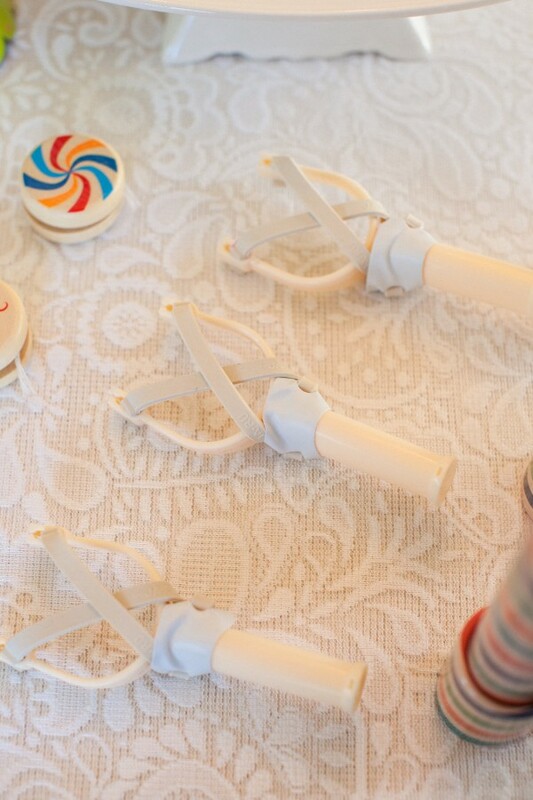 Vintage toys—kaleidoscopes, sling shots, and wooden yo-yos—were displayed on the party table as well. To create the aesthetics, we transformed a contemporary living space into a typical 1940s dining room. Vintage fringed window treatments were hung over the existing drapes. We incorporated a round antique pedestal table and staged it with a pink era radio, antique cameras, and vintage glassware. 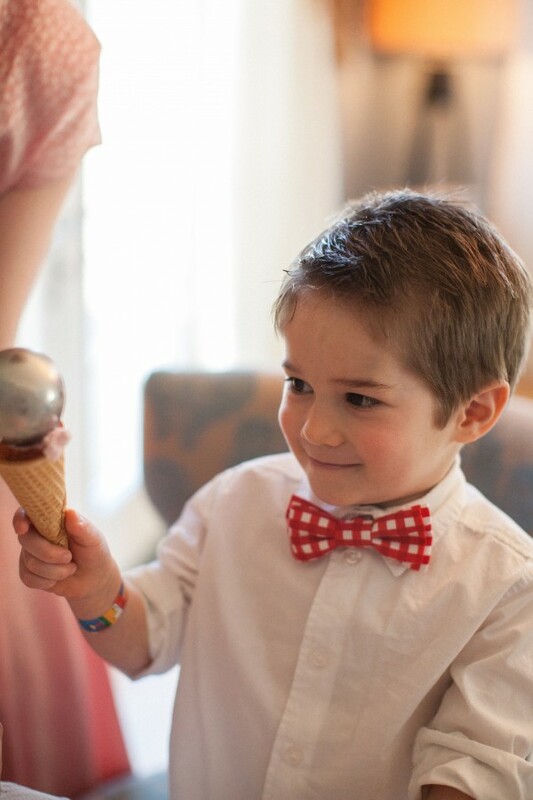 This table was staged perfectly to be a candy and ice cream station. 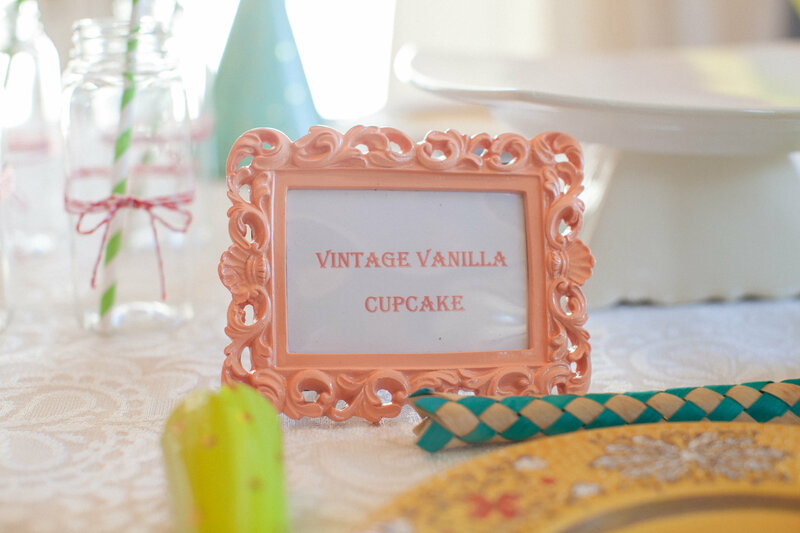 Old ornate framed artwork and the use of lace overlays on the tables put the finishing touches on our room that magically took us to a time and place where celebrations were simple and sweet. 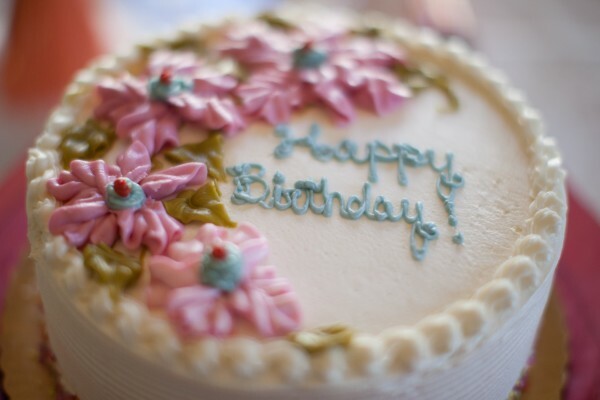 A traditional round birthday cake accented with icing flowers and sprinkles was displayed on a gold and pink pedestal at the center of the table. 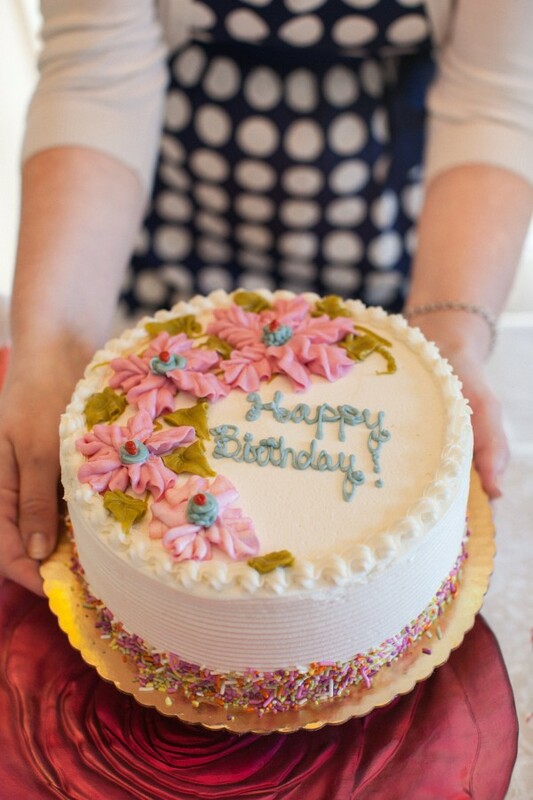 Simple cupcakes were adorned with sprinkles and small paper flowers. 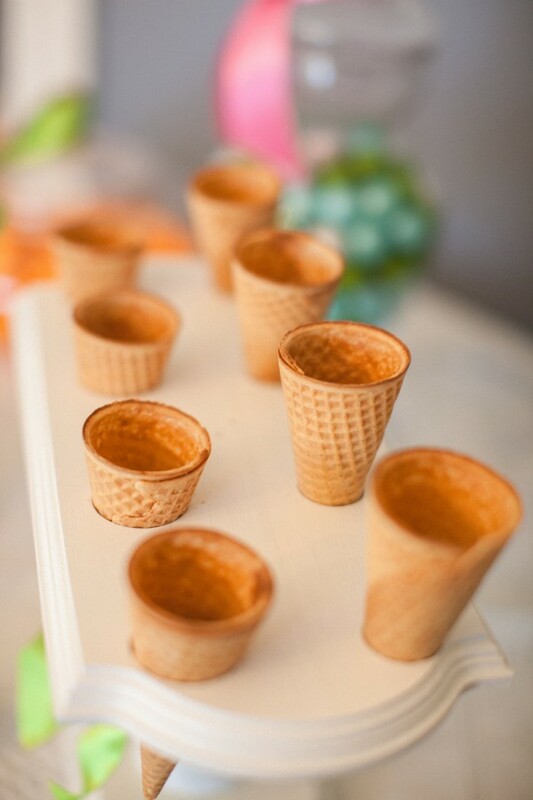 Ice cream cones were set on a stand in anticipation of cones to be filled with real strawberry ice cream! 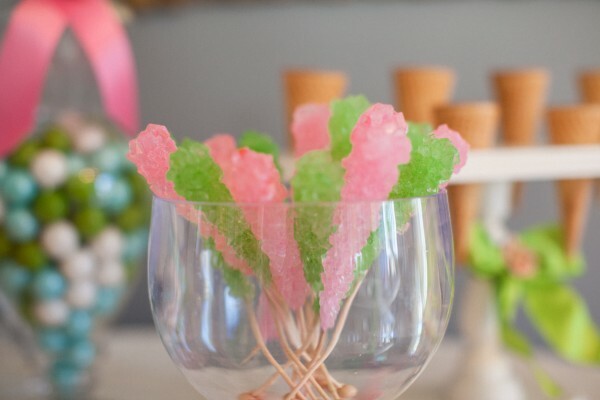 The children enjoyed a birthday lunch of hot dogs and potato chips followed by cake and ice cream, and a turn at the treat table where they filled their bags with button candy, rock candy, big colorful gumballs, and everyone’s favorite—circus peanuts! 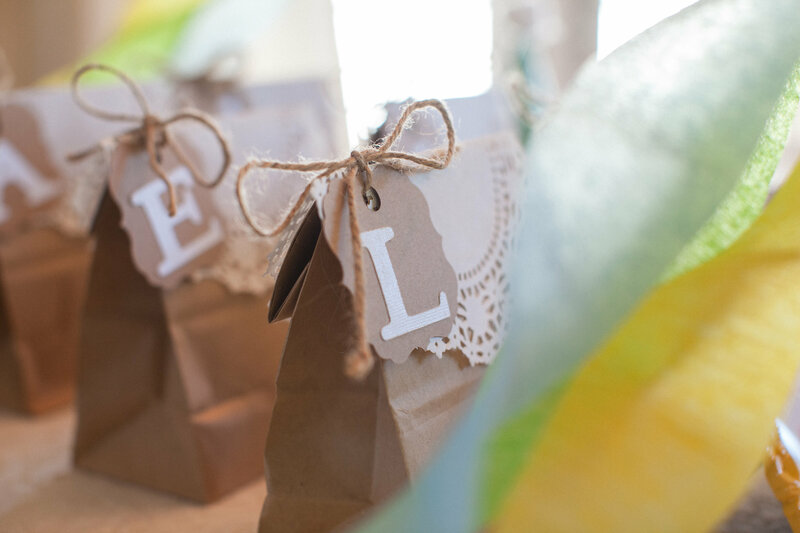 Party favors were kept simple using brown paper bags with doilies folded over and attaching a hole-punched tag with each child’s initials. 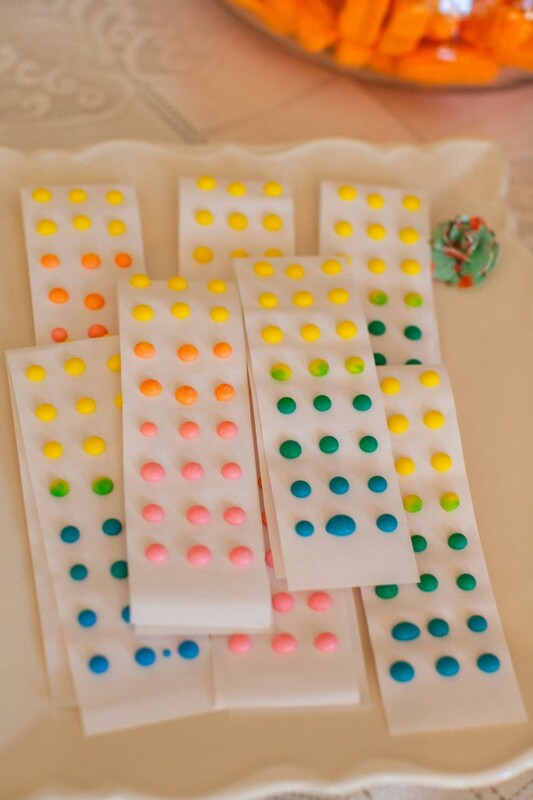 The bags were filled with yo-yos, tops, and rubber balls! Party styling and design concept Alice Nielsen | Party hats and horns from Oh Joy for Target | Vintage radio, camera, and linens from Oakton Antiques | Cake and cupcakes from Whole Foods | Our attendees and their children were dressed in vintage clothing that was reminiscent of the 1940s | Hair and makeup was styled by Maritza Buelvas | Our photographer Julie Riddle perfectly captured the feel of a vintage party. 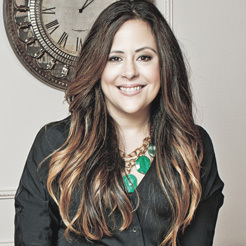 Contributor: Alice Nielsen is founder and creative director of Styled-It, Inc. She is passionate about styling parties, creating fabulous tablescapes, and entertaining.